Simple living encompasses dualisms such as in and out, spiritual and physical, man and woman and yet it is a single entity that can raise our everyday experiences to a higher level by uncomplicated but determined actions. One person that has been steadily by my side in my simplification for the past year is Melinda of Inspiration Earth - A Journey to Simplicity. The green ideas that she generously shares, as well as her sincere reflections on the topic of simple but deliberate living has set my mind on fire sometimes, robbing me of my sleep. As she describes herself: "My life is rich with books, creating, crocheting, gardening, meditating, writing, cooking, teaching and growing. Life has provided me with amazing opportunities for growth, and while at the time they were often very dark and lonely places, they led me to a resting place of deep peace and joy. I have discovered that while wisdom accrues, I will continue to learn and grow and remember until the day I move on from this place, this amazing and beautiful planet that I revere. What an amazing journey it has been so far!" Today I would love to share Melinda's advice on how to apply the rules of simple living to the organization of your home. 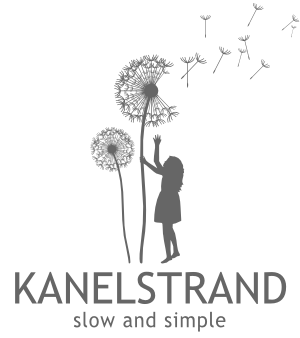 My journey to simplicity started about 8 years ago when in a desperate search for peace I began a series of changes that would alter the course of my life. It wasn’t an easy road, but with great determination and faith I am grateful every single day for where it ultimately delivered me, with great patience and care. What does living simply do for me? What does it mean in everyday terms? It means space to move freely (literally and figuratively), it means room to breathe deeply, it means freedom to do the things that I enjoy. It means being surrounded by beauty, and treasured objects. It means de-cluttering your mind as you de-clutter your surroundings. It means being inspired and yes, for me at least, it means living in peace. Living simply involves all aspects of my life, but today I thought I’d share with you some things that I’ve found helpful in organizing and simplifying my home. They appear here in random order as they came to me. My herb & spice cupboard always makes me smile. 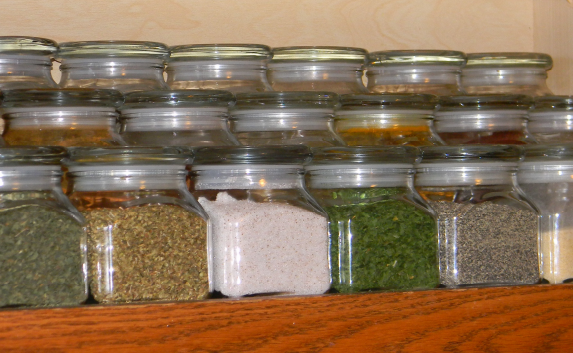 Clean, glass jars all lined up in neat rows. To achieve the layers I simply cut 2x4 pieces of lumber and the jars sit comfortably atop, making them easy to see and easy to grab! Sort through mail immediately. It arrives daily, mostly uninvited (where does all that junk mail come from?? ), and over time creates unsightly piles of useless clutter. Before it even gets put down on the counter to join its junk mail mates, sort through it. Immediately dump all the junk mail directly into the recycling bin, no questions asked. Bills go into a designated spot (I have an adorable little bill basket) and perhaps magazines into another. Stop that clutter pile before it even begins to take over your life in its quiet and insidious way! Don’t bring new purchases into your home unless you have the space for them! And by space I mean a designated spot, not a corner of the garage, or the back of the closet because you can’t find room for it in your actual living area. This is best to consider before the actual purchase is made. For me this will stop many impulse buys dead in their tracks. If I’m not willing to get rid of something that I already own, or there simply isn’t the perfect space for it, than it doesn’t belong in my home. Simple Living Rules #2 and #3 ~ Avoid impulse buys and Don’t bring new purchases into the home unless you have space for them! This is particularly hard to live by when it comes to me and my craft supplies. They whisper and beckon to me in ways that are hard to ignore! 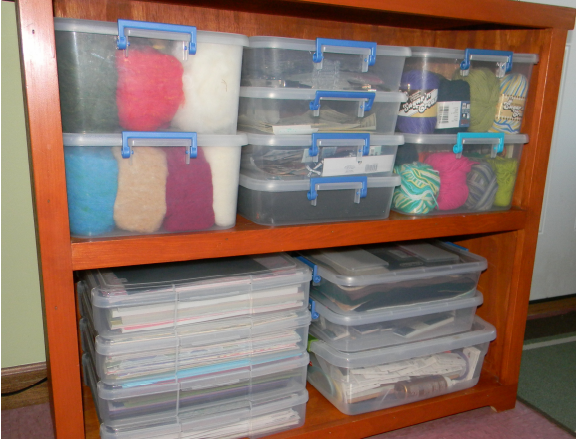 Neatly organized bins help show me when I have space, and sadly, when I don’t! Only keep what fits comfortably in the space you have. This is my number one rule when I go on a cleaning and simplifying spree. Bureau drawers are jammed? Go through them, one at a time, systematically. Make two piles ~ one for those belongings that you absolutely love/need and the other pile is for everything else. Put the love/needs neatly back in the drawer and see where you stand. Still stuffed? Do it again. And again if need be. Be patient with yourself and keep at it until you fit into the space you have. Start slow For most people it probably isn’t wise to tackle your entire home all at once. Start with one room, or area that doesn’t overwhelm you. This will later serve to motivate you when you reach those areas that really, really need your attention! 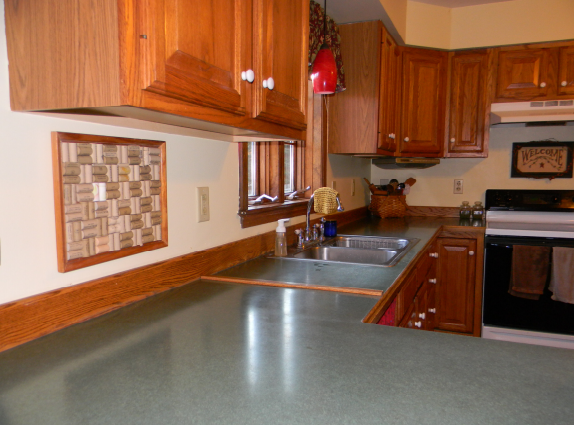 Starting with the most desperate area of your home may work for some, but it will probably just foil your attempt at simplifying before you really even get a chance to begin. Organize a bookcase. Clean out a junk drawer. Organize your movies or music. Clear everything out from under your bed. Start small and keep going. One room, one closet, one drawer at a time. Refrain from focusing on what needs to be done and instead admire and congratulate yourself on what you have already accomplished. Yes, the garage is so jam-packed with junk that you can’t even park your car there... but hey, take a look at this super neat and organized pantry. This works, I do it often. At random moments my husband will walk in and catch me admiring and smiling contentedly at a newly organized closet while chaos reigns around me. Focusing only on what is still left to be organized is often another quick route to failure. It can be, and often is, so overwhelming that the job seems insurmountable. Don’t despair, refocus on what you’ve already accomplished and bring your attention back there again and again. Simple Living Rule #6 ~ Refrain from focusing on what needs to be done and instead admire and congratulate yourself on what you have already accomplished. Start with a small space and clean and organize it thoroughly. It’ll help to motivate you on those days when de-cluttering seems overwhelming. Admire your work often, I always do! Keep only the things that you love. This was a step that took me some time. I couldn’t very well throw out everything I owned (well, I guess I could have...), all at once. But piece by piece (furniture especially), was replaced by those that I truly love. My organic cotton couches. A TV cupboard and coffee table that my husband built. The bureau that I bought when I was 16, refinished and repaired. Only my favorite books now line my bookshelves. Be inspired by the things you do keep, and as an extra bonus, donate the things that you’ve managed to clear out. Simple Living Rule #7 ~ Keep only the things that you love. A bowl my husband made back in high school, stones collected from our favorite beach, my zen clock with the beautiful chimes. All things that make me smile without overdoing it and creating clutter. Just because there’s space, doesn’t mean you need to fill it. There’s nothing more fabulous than having a clear shelf in the closet, or an empty drawer in the kitchen. Room to grow. The space that you do want to decorate? Line it with things that have meaning. 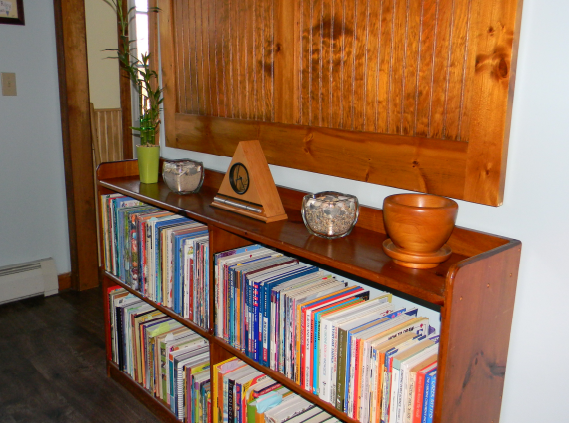 The bookshelves in my dining room are adorned with hand picked treasures that make me smile each time I look at them. The teapot and tea cups that belonged to my great grandmother. The glass bowl that holds hand selected stones from our favorite beach. A toy airplane that was my grandmothers, I can still see the shelf where it resided in her home each time I see it in mine. The space you do fill, make it special and not just an area(s) to collect meaningless junk. Pick up as you go. Make a meal? Clean the dishes. Work on a project? Put away the paint, beads or cloth. Cleaning up as you go is the easiest way to stay simplified that I can think of. It eliminates the mess before it has a chance to breed and multiply. Taking 5 or 10 minutes to pick up now saves hours by the end of the week when you’re looking at many days of overwhelming clutter. Simple Living Rule #9 ~ Pick up as you go. This is my kitchen counter this morning after we all finished our breakfast. No dishes left lying around, no crumbs littering the counter. Cleaning up as you go means that when it’s time to make the next meal I have open space to work in. Makes getting the job done easier and quicker! Don’t give up. While the road to achieve simplicity can often seem long and perhaps overwhelming, just take it one day at a time. Don’t burden yourself with unrealistic expectations. Instead just keep plugging along. Slow and steady most definitely does win the race. Pick one of Melinda's simple living rules and apply it to your home. Don't hurry, don't obsess, deliberate which one you feel most at ease with but have been neglecting and just go ahead. You have the next 9 days for the rest of Melinda's rules. Share your experience: Tell us how you did. You can come back each day and write a short comment so that we can all follow each other's progress. great advice, I have trouble with no.9 for sure!! Recently I have reduced my working hours so I can lead a simpler and stress free life, and I now have more time to tackle these things. I personally haver started a housework day and that seems to be working for us. Clean as you go is a favorite for me, t saves so much time and I especially love the kitchen after cooking. That's wonderful Charlotte that you're taking steps to simplify your life! :) Until recently I also had a housework day, I spent all of Saturday morning cleaning until the house was shining, it's such a great feeling! Now, with the way my days are structured I think I'll go back to the 'chore a day' method. This way by the end of the week the house is clean with minimal effort. I figure go with whatever works! i have been meaning to declutter our room during the start of the year but i didn't know where to start. this post is very helpful, and thank you for reminding me to take things slowly. i really have to work on my impulse buys, though! A good way to tackle impulse buys I have found is to stop the impulse, I know how funny it may sound but I like it more not to buy things straight away and to crave them for a while - the image either fades or gets stronger, so if it does and the price is acceptable, I go for them in a while. Then I enjoy what I've bought. This is a great post, very useful ideas and motivational inspiration, Thank you. I have had two de-cluttering sprees in two weeks and realise I have so much more to do. If I just keep going and see it as a long term project, I too can have space on the shelf! Yes, you are right, think of it as a long term project. Just take care not to overload yourself and after decluttering try not to accumulate clutter. After reading this post, much of what is written is what I am searching for,peace and simpleness. I have in my own way, figured out the path that is much alike the one above. Much of it I have begun in one form or another on the list..I am thankful for that progress. I am encouraged and will keep on, incorporating the rest of the list into my life. I feel good and anticipate the order of simplicity in my life. Thank you for sharing....:) Peace and simpleness, uncluttered life...I like that.. I am so glad you feel encouraged, Faith, that was exactly my intention with this challenge! Thanks to the Internet we can connect to so many amazing people around the world like Melinda and learn from them. Good luck on your path to peace and simplicity! Thanks for this...just the inspiration I needed! Terrific Tips Melinda! My mom was a hoarder so your rules are rules that I have always lived by. I can't stand clutter! Rule #2 has always been the hardest for me and your advice is exactly what I have been doing and it works! Wait, after a few days you will have a much better idea of whether you really need that particular item or not. I also stay away from stores. I never liked shopping anyway. That affirmation makes my husband laugh. I then have to explain that I loved to have things, just not shopping for them! I am trying to teach my teenagers this rule and that's even harder than changing myself! Laurie, I have to agree with you because stores make me dizzy! But then, Melinda's advice on how to tackle impulse buys is great and I am doing something similar. The mere walking away and letting it naturally evolve or disintegrate does magic! On the other hand, frugal as I think I am, my husband usually has a thing or two to say, which brings me back to Step 1 of the challenge... ah, simplicity! These are great tips. I'm starting to get into the "clean as you go" mentality. It's amazing what a difference it makes to do the dishes right after dinner instead of forgetting about them for a while and seeing them again right before bed. My in-laws have always been "clean as you go" people and their house always looks nice. These are all wonderful tips. "Clean as you go " is one of my favorites... I've always done this and I love how it speeds up house cleaning.. " also " the one room at a time approach works wonders too... We've taught our children how to sift, toss, and donate since they were old enough to help. Don't forget the value of selling quality items on E bay. Our teenaged son just sold off his entire Lego collection on E bay. The proceeds allowed him to up grade his computer so he could further his dreams of learning music producing. That was a win win... no more bins full of UN wanted items in the basement! This put a dent in our largest area to complete which is our basement. It's a start! Teaching your kids to go through their possessions and deliberate which one stays and which one goes is such an important step to take at a young age. And what your son did with his Lego shows that you have done a great job raising him. Good for him to invest in his dreams! I do a lot of these steps already out of necessity, always having lived in small apartments makes you more mindful of the things you buy because there just isn't a lot of space. And I often have to choose something to give away when I buy something new. I could be much better, though, about "cleaning as I go" when I'm working on an art project. Art and craft materials tend to explode all over the living room when I'm in the midst of a project, and I usually don't stop to clean until I'm finished. I get so focused on what I'm making. I often think, "I hope no one knocks on the door right now because they will think I'm insane or a hoarder or something." That's why we really want to move to a place where there's at least one spare room (whether it's an office, bedroom, whatever) just another place for me to work that has a door that can be closed when we have company over. I think it suits me better to strike while the iron is hot, so to speak, to work while the inspiration and creativity is flowing. If I stop to clean or answer the phone or whatever, I get out of the zone and it's hard to get back in. Small spaces are beneficial indeed as far as clutter is concerned. But for inspirational purposes you do need your space so that you let your imagination and tools soar! I wish you just the right size of space with a room for your amazing felt creations! WOW - this is so awesome. I really really really need to do this. I would be so much happier in my home if things weren't so cluttered. In all fairness, I do operate a print shop from my home, plus a home office and sewing room - all of which are business related. I have stopped buying stuff since Jan 1st. My goal is to use ONLY the supplies I have - no more purchasing. Within a few months that should help pare things down. This post has been super inspirational.I am going to share it with my husband as he has been wanting to clear things out as well! That is a big step Brandi. I am sure that using only the supplies you have will trigger your imagination as well, apart from ridding you of clutter. Uncluttered spaces lead to an uncluttered mind! Such a useful post! I love it! I am currently working on simplifying my household. I'm working part time until mid-June probably, so my goal is to pare down and simplify as much as I can before then so that I have way less to worry about and take care of when I start working full time again. This time period will also mark about one year ago that I started minimalising and simplifying my life and I would love to be totally done! I have been learning a lot about myself in the process of going through all of my things and every week I feel like I make a little more progress. On Sunday I'm going to take several hours to go through a BUNCH of clothing and just list it all on eBay. It's funny how when you start going through your belongings there are little things that kinda stick out in your mind as *maaaybe* you should get rid of, but then you justify them somehow, but they just keep nagging you and then finally you get rid of them and feel so much more free! Good luck with listing your clothes on ebay! I hope you use the income for your dream! These are such important guidelines. I feel like I should tattoo them on my arm (except I don't like tattoos!). It is especially hard to declutter right now at our house. We have inherited many things as our parents downsized and then another relative passed away. It is very hard to get rid of family heirlooms (and many of these are multi-generational heirlooms), but one simply cannot keep everything. It is tough, but we are working at it. Haha, you totally made me laugh with your tattoo idea! I am sure that decluttering inherited or emotionally important stuff is a really hard job. I wish you to find the golden middle in that process. Love your simple living rules, very inspirational! "Clean as you go" is probably the hardest one for me, mostly because it's this never-ending cycle and I hate cleaning, but on the weeks I manage to do it every day, it's so much easier to work! Its funny, having too much mess around me makes me forget what I have to do--I just won't remember what I was working on the day before as it camoflagues into my messes. The camouflaging tasks are not new to me! That is why I love to have it as clean as possible in the house. 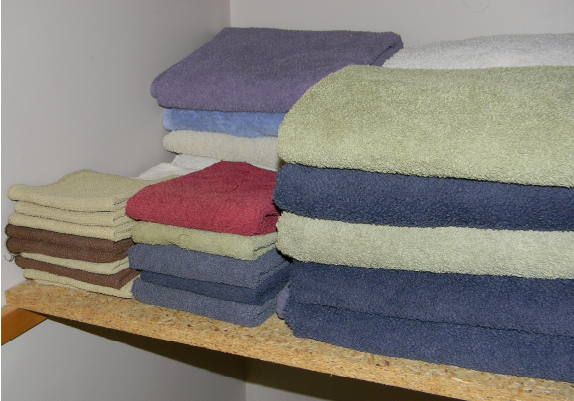 But when I say as clean as possible, I really mean it - it is not always possible to have immaculate order. We should always try to find balance between what we have to do and what we can do. This way we are balancing or strive for perfectionism as well! #5 is my favorite at the moment. I can start with a space that isn't overwhelming to put in order, and build from there. Going slow is always the way, isn't it? Then you have the time to put your thoughts in order too! great post! Rule #6 especially. This applies to many areas of life. Focus on what has been done, not on what hasn't. Excellent rules! I need to work on #7, keep only the things that you love. I need to reevaluate my stuff with this in mind. You know, I've noticed that practice does make perfect. If you make up your mind, you will not only go through your stuff to deliberate what you really care about but you will apply the "loving" part to your buys as well. Dear Melinda, thank you so much for your effort at displaying your attitude to simplicity. I am sure that everyone has taken at least one of your rules to heart (at least I have!) and will use it on their path to simplification. After so many wonderful comments I am sure that you have lightened up our minds and have inspired and encouraged us to the level of actually simplifying! The amazing one is you, thank you! You are amazing Melinda. I am so thankful that I know you! Thank YOU! Great guest post, Mom!! Lots of easy ways to simplify...thankfully, having grown up with you I've kind of adopted your cleanliness. ;) I love having neat and organized areas of my own!! These are some awesome tips, though, for people who don't live with neat freaks. ;) Great job! They are all very practical and easy to incorporate into your life. I am working on simplifying my life and I will be using a lot of these tips until they become a regular part of my life. These are really great ideas! !